This entry was posted in 2011, Reviews and tagged 18th century German romanticism, Donmar Warehouse, Michael Grandage, Mike Poulton, Peter McKintosh, Schiller on November 1, 2016 by Carole Woddis. 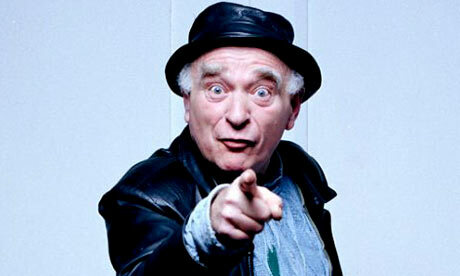 Ken Campbell was a one-off. Anyone who saw him will remember that he was inimical; he simply couldn’t be replicated. It was in part the wild eyed effervescence and joy, the digressionary tales that beavered off into highways and byways and took such circuituous detours you thought he’d never get back to the main road – or thematic thrust. And then there was the tumbling erudition, pouring out of him, the absurdity of it as well as the cosmic intelligence. And those eyebrows. Set for take-off. I didn’t see him nearly enough, only catching up with him towards the end of his life when he had practically become a National Treasure. So I missed The Warp, Recollections of a Furtive Nudist, Illuminatus and many more. I think I may have caught The Pidgin Macbeth, Jamais Vu and Theatre Stories. For anyone wanting to know exactly how the lad from Ilford ended up wowing audiences at the Cottesloe as much as in Liverpool’s Hope Street, look no further than Michael Coveney’s ebullient `authorised biography’ according to the grey parrot who shares Coveney’s cover page. Coveney’s admiration and appreciation of Campbell as a force of nature and maverick counter-balance to the puffed-up worthies who dominate British theatre shines out from every page. Coveney, another unlikely lad from the Essex marshes, clearly feels affinities with Campbell’s egocentricities as well as his obsessions. There is hardly a dull moment in the entire 250 odd pages and a more engaging, juicy and yes, erudite account of the spirit that animated `alternative’ and fringe theatre through the 1960s, ‘70s and ‘80s it would be hard to find. This is a first rate primer of that extraordinary time, filled with egocentricity, sci-fi and paranormal happenings. And unputdownable. This entry was posted in 2011, Features and tagged Ken Campbell, Michael Coveney, Unfinished Histories on November 3, 2015 by Carole Woddis.